When you stand on the scale you get the truth about your weight. "It's what's inside that counts." Why do we lie to ourselves, when the truth is right in front of us? And it matters? My Latest SlideShare Upload: "Job of the Future: 'Human Glue'"
A reflection on enterprise collaboration software in context. Enjoy!Job Of The Future: Human Glue by Dannielle Blumenthal, Ph.D.
Also see a whole megilla I started on this subject on GovLoop. A couple of downloadable files there. Note: No endorsement is expressed or implied. Opinions my own. Welcome any feedback. This morning my mother reminded me of a story I would rather forget. "Do you remember when you wore Bubbie's bathrobe to shul (synagogue) thinking it was a dress?" Oh G-d Mom just bring up all the dirty laundry why don't you! "And how mad she got?" My Bubbie had such beautiful clothes. To my childlike eyes I couldn't tell the difference. Since her clothes were all fancy, from a certain perspective you could take the mis-wearing of the robe as a compliment. But Bubbie didn't see it that way. In her world, children were an extension of parents. Grandchildren an extension of grandparents. I know why my Bubbie thought that way. For the culture to survive, true members of the Hasidic sect we belonged to had to be marked. And each family had its own reputation to protect. Its image. Its brand. Rage. Anger. Envy. Terror. Fear. Grief. Sadness. Depression. Stress. If it walks like a duck, talks like a duck and looks like a duck, it's a duck. 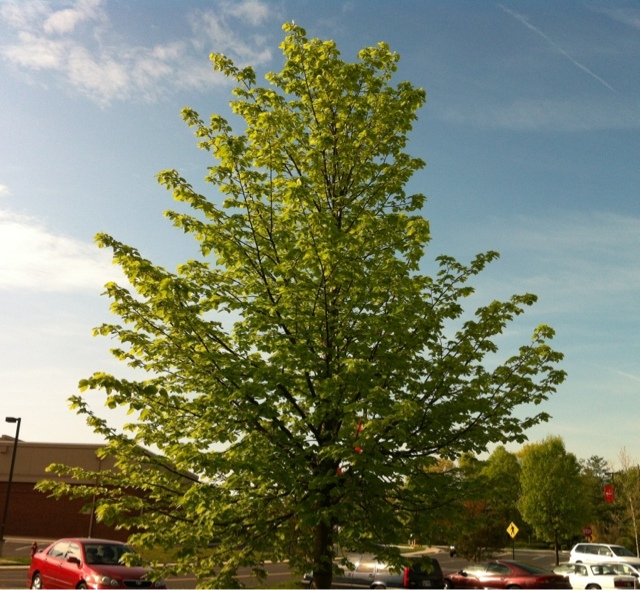 Just like a tree has to be green and leafy and grow tall, even among a stale parking lot full of cars. The branding profession is about image. That's fine, but that's as far as it goes. Those who claim to do more - such as changing the employee culture - are not brand ducks. Over the years I have sometimes found that people got annoyed at my blunt and direct manner. In the end that's how I learned that I don't really do branding. Because brand ducks are adept not only at building your image, but at projecting an image of themselves. When Faith Turns Deadly: Bill Maher's "Religulous"
Jose Luis De Jesus Miranda: "You know, if I discover that I was Satan in person, I would do a good job, too." Jose Luis De Jesus Miranda:"Because I would be faithful to my calling." Just happened to run across "Religulous" on Netflix. Spent nearly 2 hours unable to peel self from screen. Alternately laughing and sort of crying inside. At how much people want to believe; at how willing we are to deceive each other in G-d's name; at how easily we deceive ourselves. And then punish other people who refuse not to think. The body of the movie consists of Maher interviewing assorted representatives of various religions and religious sects, including Christianity (mainstream, evangelical, Catholicism), Islam, Judaism, and Mormonism. 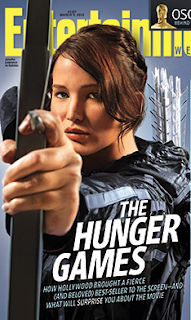 No-Propaganda Government Communication: Is It Possible? Thirty years ago it was almost unheard of to pay a public relations firm to communicate on behalf of the federal government: we spent just $2 million over the course of 12 years, from 1980-1992. By 2003 that figure had soared to $161 million (see graphic). 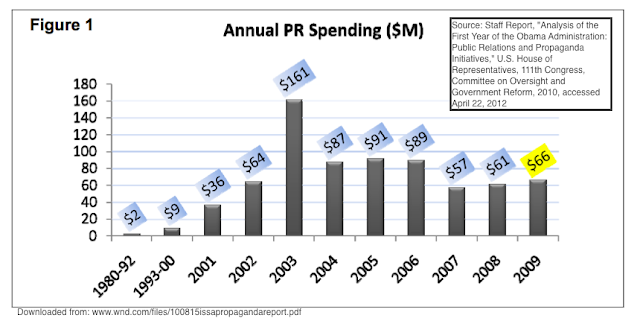 In addition to spending on public relations, the government spends money on advertising. It is estimated that federal ad spending in fiscal year 2002 was more than $400 million, peaked in 2004 and 2009 at $1.2 billion or more, and settled back down at about $750 million in 2011 (see graphic). Government PR versus Advertising: Why The Distinction? What's The Difference? I don't do branding anymore - over time it's become communications and process improvement, with organizational development thrown into the mix. While I haven't lost interest in branding at all, it has become clearer and clearer to me that branding is only the outcome of a much more complicated, difficult and interesting process to sustain: successful organizational development. I have realized over time that focusing on your external image is sort of beside the point, especially nowadays when the innards of organizations are more and more transparent. What matters more - what matters most - is culture, because it gives birth to stable processes that in turn engender performance, learning, innovation, and growth. It is culture that lives at the bedrock of the organization. When you have it working well, the right image emerges naturally, without strain and without the artificial look and feel that can actually be a turnoff to the stakeholder. So lately I've been thinking about the exquisite pain that is document generation, collaboration and final approval in the typical organization. To continue the dental metaphor, one wonders why we put ourselves through the equivalent of root canal every single day. When you hear that a new policy has to be generated, or sent around for approval, do you not groan? Of course you do. You do! Scandal: "Dysfunctional Culture" or "Isolated Incident"? The news is always dominated by scandal and the news this morning is no different. Ugly reports of ugly behavior. Army: In Afghanistan, photographs of soldiers smiling "thumbs up" alongside dead bodies and across the military there is a pattern of female service members raped or sexually assaulted then discharged for a "personality disorder. "Secret Service: In Colombia, a prostitution scandal and we learn the motto, "Wheels up, rings off"GSA: In Las Vegas, a conference overseen by an official who wrote, "I know I'm bad, but why not enjoy it while we can? "If these are just isolated incidents it's easier to deal with them: Punish the offender and you're done. Oh how tempting it is to "apologize" or put someone in jail and call it a day. Election 2012: "Boring" vs. "Daring"
In a gym full of Feds watching the TV monitors. It's evening news time. -One screen has a commentator talking about Mitt Romney, the word "robotic" flashing behind him. -Another has coverage of the GSA scandal. It is unflattering. -A third flashes the words "Secret Service" and then something like "20 prostitutes!" -Fourth there is the President with Treasury Secretary Tim Geithner. Images of oil barrels, of people at the gas pump. -Fifth and finally there is Secretary of State Hillary Clinton. I feel sheer admiration. I am a fed standing among all these other feds, of different agencies. I feel shame at the government scandals. This isn't how I am, I remind myself, it isn't how most of my colleagues are. I wonder how we got here, that the people one should trust seem so out of control. In a work organization, the only thing that matters is productivity. 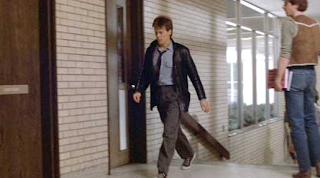 After high school hoodlums throw a brick through the window, narrowly missing his little cousins "Ren's" (Kevin Bacon's) uncle verbally attacks him for stirring up trouble in Bomont. It's a trivial cause at best (and "sacreligious" at worst), the right to a high school prom. Ren finds out that his uncle is losing business and his mom has just gotten fired from her job over his cause. He doesn't seem to care. When his mother asks him why he persists, he answers as below. As I watched Ren say this on screen, I realized why I watch this movie every time it airs and why I sometimes cry when I see it. Why I write blogs that nobody pays me for and that often, relatively few people read. Why I find it important to say something. "His wife has actually never worked a day in her life. She's never really dealt with the kinds of economic issues that a majority of the women in this country are facing." By now everybody has seen Ms. Rosen say this on the news. Undoubtedly they've thrown shoes, when they heard this obnoxious statement. It brought me back to the anger I felt as a young mother, entrepreneur, and doctoral student as people observed me with the kids and asked, finally, "Do you work?" Yes, actually, I used to think, enraged at the kind of mindset that produced such condescension. Do you? 50% Of Your Salary To Write Emails: Are You Worth It?